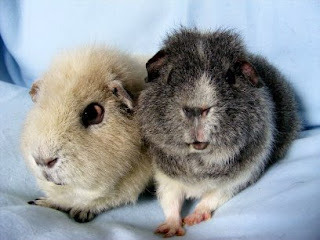 Searching for happy endings » Sponsor a Guinea Pig for March! Sponsor a Guinea Pig for March! Yay for Maddie! Sponsor a Guinea Pig raised an amazing $370 for our little girl in February, that’s $100 over our original goal! We can’t say thank you enough to all the wonderful folks who have donated! Maddie will say THANK YOU when she’s not catching up on her beauty sleep! from the Scottish Rescue Thistle Cavies! Josh and Yetti are just two special needs piggies at Thistle Cavies, and they are the best of buds. Josh is 6.5 years old and has been with the rescue for 3 and a half years. Yetti is a white rex who developed heart problems about 18 months ago, at the same as Josh, who had already suffered from a host of other medical problems. Prior to his heart issues, Josh required extensive surgery for a jawbone abscess shortly after his arrival. An infection had eaten away part of his jawbone and part of his jaw had to be removed, as well as one of his bottom incisors. Despite the most meticulous of care the rescue feared they might lose Josh, and for two months his recovery seemed unsure. But eventually he started putting on weight, and never looked back! Now his surgery site needs to be maintained with regular procedures, but Josh is the definition of a patient piggy. He is a calm sweetheart who loves being syringefed, despite his mouth issues. He is also a super cuddle piggy who just snuggles into you as soon as he’s picked up. Yetti is his best friend, and the two simply can’t be separated. Yetti’s heart issues make him a candidate for Sponsor a Guinea Pig alone, but with the close bond they have it’s doubtful Yetti would let Josh go on without him anyway! We hope to help ease the financial burden of this small, home based rescue by fundraising for part of their care, just as the medications will be easing the physical burden on these small boys’ dear hearts. SAGP is trying fundraise enough to pay for the expensive dental growth removal (£45.oo or $63. 71), six weeks worth of medication: Fortekor (£22.50 or $31.85), Frusemide (£2.20 or $3.11), Rimadyl (£18.30 or $25.91) and Critical Care (£29.29 or $41.47), as well as two additional packages of Critical Care for the boys 2x(£29.29 or $41.47). This is for a total of £175.87 or ~$248.99, using an exchange rate of £1:$1.41574 as of 2/28/2009. Please visit Sponsor a Guinea Pig to see both US and UK currency donation links at bottom Josh & Yetti’s entry!